On 15 April 2019, just before 18:20 CEST, a structure fire broke out beneath the roof of Notre-Dame Cathedral, Paris. By the time it was extinguished 15 hours later, the building's spire and most of its roof had been destroyed and its upper walls severely damaged; extensive damage to the interior was prevented by its stone vaulted ceiling, which largely contained the burning roof as it collapsed. Many works of art and other treasures were evacuated early in the emergency, but many others were damaged or destroyed. The cathedral's two pipe organs, and its three 13th-century rose windows, suffered little or no damage. Three people were injured. France's president Emmanuel Macron vowed that the cathedral would be restored, and launched a fundraising campaign which brought in pledges of over €1 billion as of 22 April 2019[update]. It has been estimated that restoration could require twenty years or more. According to the president of the Friends of Notre-Dame of Paris Foundation, the stonework in the cathedral's flying buttresses was being eroded by the action of years of weather and pollution, and the spire had extensively rotted because fissures in its lead sheathing were admitting water. In 2014, the Ministry of Culture estimated needed renovations at €150 million, and in 2016 the Archdiocese of Paris launched an appeal to raise €100 million over the following five to ten years. At the time of the fire, the spire was undergoing renovation and scaffolding had been erected around some of the roof. At 18:20 the fire alarm sounded and guards evacuated the cathedral within minutes; one climbed to the space beneath the roof but seeing no fire gave the all-clear. At 18:43 the alarm sounded again; at 18:49 two guards investigated again, this time finding flames. The alarm system was not designed to automatically notify the fire brigade, which was summoned only at 18:51 after the guards had returned. Firefighters arrived at the church within ten minutes after the call was issued. The roof's lead sheathing would initially have slowed the fire by excluding air, but once it started melting, air would be admitted allowing the fire to grow. Molten lead falling from the roof also posed a hazard for firefighters. Most of the fire was extinguished by 23:30, and was considered completely extinguished after about twelve hours. 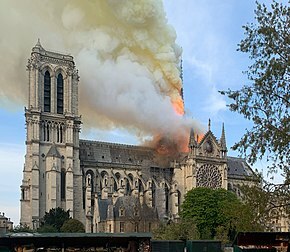 The Paris fire chief said the bell towers and other structural elements would have likely been destroyed had the fire burned for another 30 minutes. One firefighter and two police officers were injured. The renovations presented a fire risk from sparks, short circuits, and heat from welding (roof repairs involved cutting, and welding lead sheets resting on timber ) Normally, no electrical installations were allowed in the roof space due to the extreme fire risk. The roof framing was of very dry timber, often powdery with age, and after the fire the architect responsible for fire safety at the cathedral acknowledged that the rate at which fire might spread had been underestimated, and experts said it was well known that a fire in the roof's old, dry timbers would be almost impossible to control. On the night of the fire, Macron announced that the cathedral, which is owned by the state, would be rebuilt, and launched an international fundraising campaign the next day. 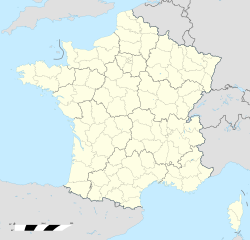 The cathedral itself, as well as several other historical buildings in France, was not insured due to cost constraints, leaving the costs to rebuild to the state. The heritage conservation organisation Fondation du Patrimoine estimated the damage in the hundreds of millions of euros; European art insurers stated the cost would be similar to ongoing renovations of the Palace of Westminster in London, which currently is estimated around €7 billion. ^ Inti Laudauro (17 April 2017). "Paris firefighters got on Notre-Dame site in less than 10 minutes". Reuters. Retrieved 23 April 2019. ^ a b c Berlinger, Joshua (16 April 2019). "Why the Notre Dame fire was so hard to put out". CNN. Archived from the original on 16 April 2019. Retrieved 16 April 2019. ^ Goodheart, Adam (17 April 2019). "Who saved Notre Dame? Its builders". Op-Ed. Los Angeles Times. Retrieved 23 April 2019. ^ "France's Macron requests post-fire pause from politics". AP News. 16 April 2019. Retrieved 23 April 2019. ^ "Notre-Dame: «attristé», l'Iran pense aux «Français et à tous les catholiques»". Le Figaro. 16 April 2009. ^ "Notre Dame cathedral fire: President and prime minister express sympathy with France". Radio Bulgaria. 16 April 2019. Retrieved 23 April 2019. ^ Casert, Raf (22 April 2019). "Notre Dame fire was a warning bell. But will Europe listen?". AP News. Retrieved 23 April 2019. ^ Nugent, Ciara (17 April 2019). "Pledges Reach Almost $1 Billion To Rebuild Paris' Notre Dame Cathedral". Time. Retrieved 23 April 2019.